A few weeks ago I started a new personal project using JHipster. JHipster is a great Yeoman generator used to generate a complete Spring application on the server side and AngularJS on the client side. Julien Dubois, the lead developer of this project, has done a excellent job putting a bunch of technologies all together (here you can find a complete list of all the technologies used). In the Jhipster project, you can find a docker container which includes all the necessary libraries for running your project in development mode. Nevertheless, a docker container for production mode is missing. What does this docker include? 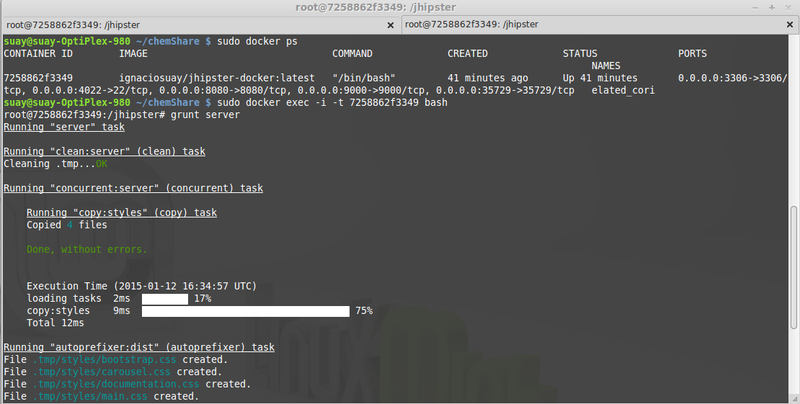 The present docker is an extension of Dubois docker, including a MySql database, Grunt, Bower, and a bash script which creates a database and runs the application using the production profile. Finally you will need to run the script in /usr/local/bin, to start the mysql service and run the application using the production profile. $MYSQL -u root -e "CREATE DATABASE IF NOT EXISTS jhipster"
# Run your project in production mode. Use your favourite editor and add your database name at the end of the line 6, instead of “jhipster”. unable to find gruntfile or unable to find local grunt. This is the first time I am using docker, any help will be appreciated. You need to be sure that the path to your local project is correct (~/your_app_folder:/jhipster). Everything in that folder will be copied to /jhipster inside your container. 2) Once you are logged in your container you need to be sure that you are in the correct path. In this case, I have copied my project to /jhipster folder, so inside this folder you will need to run: grunt serve. Hope it helps! Please let me know if you have any comments or queries.